Clickable map of walks, visits and beaches on this site. Where are the best beaches on the Costa Brava? The Costa Brava has all sorts of beaches from little isolated coves to wide broad sand bays that stretch for kilometres (eg Pals or Palamos). For exploring the Costa Brava for even the well known paths like the GR92, it's very useful to take maps, particularly for new areas. Not every path is always on the map, but at least it means you know when you're really lost. These are the maps we use. The weather is one of the main reasons for visiting and living in the Costa Brava. Summers are hot and winters are mild with lots of blue sky and sunshine which means there is good walking for ten months of the year, and swimming at the beach for the remaining two. The Costa Brava coasts teem with fish making it a perfect place for snorkelling, diving and long distance swimming. However, being a natural environment occasionally you do run into jellyfish (medusa in most European languages - imagine the Gorgon's head). Most of the year you see isolated medusa near the coast and fortunately the waters are normally so clear that if you wear goggles and keep a look out you can avoid them. A day-to-day report of jellyfish presence at beaches can be found at Medjelly. Getting lost is a common (and enjoyable) hazard when walking new routes on the Costa Brava. Broadly speaking you can follow most paths and tracks that you come across except those marked Cami Particular (private road). In the woods there are tons of routes and hunter trails many which aren't marked on maps. As spring and summer arrive in Catalonia it becomes important to carry water on the walk - even for something relatively short. And obviously suntan lotion. The views are also typically better in winter than in summer. The pictures and photos that we've included are those taken on the walk as described so these are real photos from the walk so subject to the weather or haze of the day. A selection of our best photos of the Costa Brava can be purchased online at RedBubble. Full size versions of other pictures are available on request. A common question for travellers is how to reach the Costa Brava and how long will it take. From both Barcelona and Girona there are direct buses (see www.sarfa.com) which run regular services. Alternatively trains connect Blanes at the south, or Llanca in the north, but there are no train lines in the centre. Driving is easy with autoroute and dual carriageway connections most of the way. Cycling or driving rather than walking? We tend to walk routes in the Costa Brava that are not normally drive-able (generally we avoid traffic) but they are often accessible by bicycle with good options for mountain biking. Routes here rarely have gates and we've not seen stiles or other barriers as such and we regularly see wheel tracks on the paths even on the steeper rockier paths through the woods. Some of the dirt track routes would be accessible by 4x4 (just don't ruin it for the rest of us). During the summer you won't find any of the smaller bays or local or prettier beaches that will allow dogs. And through the summer generally dogs aren't allowed on beaches particularly if there are sunbathers about. However, some of the long beach stretches away from houses and campsites may be OK if there is no-one about. In the winter people do take dogs to the beach and it's broadly tolerated. Your detail is unbelievable. Thank you for sharing your knowledge! We are there in October and cycling from Ripoll to Sant Feliu and then I was going to cycle to Callela de Palafrugall. Is the cycle route scenic? I' m guessing it won't be right against the coast as some of the walking paths are . Maybe we should walk. We are staying in Begur for 3 days so will do some walks then. ( we also will have a car then) Thanks again for a fantastic web site! From Sant Feliu you can cycle around the headland estate behind the port (a little hilly, but the main road alternative is quite busy and not so nice), then come down from the estate and along Platja Sant Pol to the back of S'Agaro (I don't believe you're allowed to cycle the S'Agaro coast path though it's wide enough) and on to the heart of Platja d'Aro (there's a road by the beach to avoid the traffic in the centre). The route to Sant Antoni de Calonge then goes up a hill past hotels and campsites but the very pretty beaches and coves are all off the road - accessible for walking, but not suitable for bikes. In Sant Antoni de Calonge cycle all along the beach-front, then all the way around the Port de Palamos headland. Then to La Fosca which connects via cyclable gravel paths at the back of Kings Camping with Platja Castell and the Ruta del Tren Petit. You can take the coastal track in Castell/Cap Roig woods to Calella de Palafrugell but it has some steep bits - the Petit Tren route is easier and also picturesque. The GR92 around Begur is quite up and down. Easier are the areas south of Llafranc to La Fosca is really pretty and quite straightforward, particularly if you deviate a little and take the route along the beaches from El Crit to Cala Estreta. I was wondering if you could recommend a beach town in costa brava to stay in overnight, that is accessible from barcelona by public transport, and that has some walks along the coast from there. As we don't have a car, and would like to explore a bit for a day or two on foot. 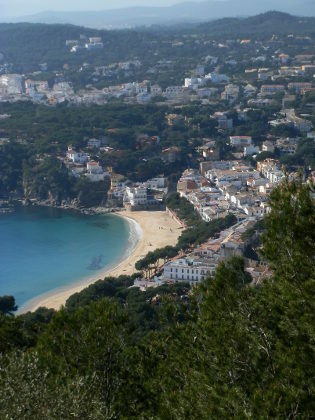 The mid-parts of the Costa Brava are accessible by bus from Estacio de Nord, and there is lots of walking around Palafrugell and the Cami de Ronda, just check the bus journey time as it can be a little long. To the south, Blanes connects with the train line to Barcelona. We used to come up from Barcelona to Blanes, then take a Dolfi Jet boat up the coast. The walks can get stuck in estates but the coast remains beautiful, even around tourist hotspots like Lloret. For residents there are free/low-cost Catalan courses provided by the Generalitat via the Consorci per a la Normalitazio Linguistica (http://www.cpnl.cat) in centres across Catalonia. If you're living in Catalonia then at least the basic course is worthwhile as Catalan is the everyday language in many social, work and administrative situations like schools, clubs and associations for integration. If you're travelling, or here temporarily, some Catalan phrases are useful, but obviously worldwide Spanish is spoken more widely and, in practice, everyone in Catalonia is bilingual with an almost automatic switch to Spanish if you're foreign. So it sort of depends on whether you just want to get by, or whether you want to be more integrated. This is a fantastic site and we really enjoyed our brief October trip and walks more because of it, so a big thank you for all the time you've invested in it. Love your work. It us our main 'go to' website when we are planning our trips to Begur. Your background info on history etc makes us look intelligent to our friends! Are there any other websites that you could recommend or that you use? Many of the routes have information signs on the way to give a flavour. Viquipedia - the Catalan Wikipedia has a lot of detail that doesn't get to the English language entries if you read Catalan. The Revista del Baix Emporda magazine (also in Catalan), and local magazines from the ajuntaments, and then into history books for Catalonia and the region. Costabrava.org is the main tourist website and has suggestions for places. Wikilocs has descriptions of walks taken, again mostly Catalan/Spanish. And Diari de Girona or Punt d'Avui run suggestions for places to visit for locals. Hi, Do you know of anyone offering a baggage transfer service ( similar to those on the Camino). We might not wish to tote heavy rucksacks from hotel to hotel! There are some specialist walking holidays who offer included luggage transfers. If you're doing it yourself and arranging directly, then I think you'll have to ask the hotels. It wouldn't be too difficult to ask the hotel to arrange a taxi for your luggage from one hotel to the next.